Near the green vegetation growing along the edge of the beach at the Pinware River mouth in Southern Labrador, an artist visited and created a beautiful design using mussel shells. The work of this artist will remain on the sandy beach until the water from the Pinware River rushes up the shore and takes the mussell shells back with it. 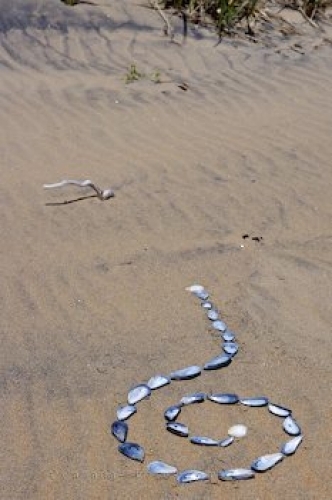 Picture of work done by an artist using mussel shells on the beach in Southern Labrador.